The G-Shock Mudmaster GSG-100 series is basically the same as the Mudmaster GWG-100 series released in Japan and China, only without the Multi-Band 6 radio time syncing feature. 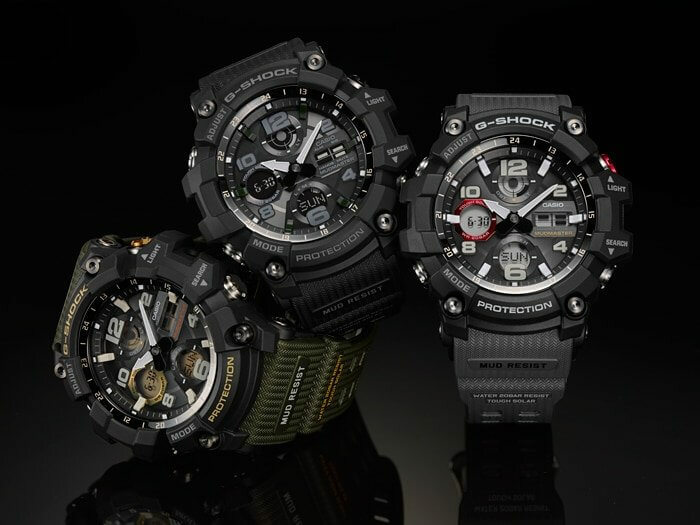 The GSG-100 is similar in size to the Mudmaster GG-1000 Twin Sensor non-solar model and a little smaller than the original Mudmaster GWG-1000 Triple Sensor model. The GSG-100 and GWG-100 do not have any sensors like the other Mudmaster lines but they do have a superior lighting feature. The GSG-100 has full auto dual LED lights with a Neon Illuminator blacklight LED for the hands and markers and a Super Illuminator for the LCD displays. As part of the Mudmaster family these watches are mud-resistant with a cylindrical button guard structure that protects the buttons from impact and keeps out mud, dust, and sand. The look of the watch is inspired by disaster relief vehicles and tools and the simple, rugged design will likely appeal to those who work outdoors in demanding jobs. The debut Mudmaster GSG-100 models include the GSG-100-1A with black band, GSG-100-1A3 with green band, and GSG-100-1A8 with gray band. Those who plan to use the digital LCD displays often should opt for the GSG-100-1A3 or GSG-100-1A8 with a standard LCD display. The GSG-100 series is a February 2018 release in Asia and we expect to see a wider international release soon. 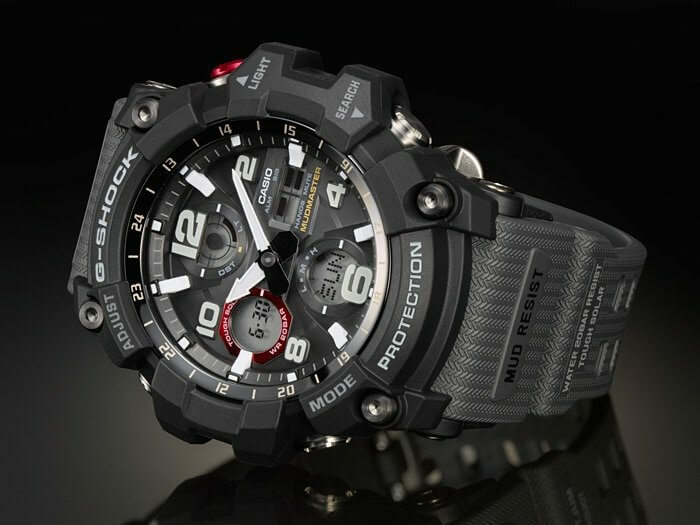 Features include shock resistance, 200-meter water resistance, mud resistance, Tough Solar power, full auto dual LED lights (Neon Illuminator and Super Illuminator), world time, 1/100 second stopwatch (max 59’59.99” with elapsed time, split time, 1st-2nd place times), countdown timer (100 minutes), 5 daily alarms, battery level indicator, and power saving function. Can you tell me which version will be sold in Italy? GWG or GSG or both? Not sure right now, but Europe and Italy did get the G-STEEL GST-WXXX models with Multi-Band 6 so I think it might be the GWG-100. Europe is getting the GWG-100 series. will GWG-100 series will be available in ksa? USA? Yes the GWG100-1A8 is available at ShopCasio now. I talked to ShopCasio yesterday. They do not have it in stock yet. Maybe within 10 days. Is the gsg100 self adjusting the time when it come to low battery. When the battery is move to the M. Its self adjusting the time? GSG-100 does not have Multi-Band 6 automatic time adjustment. That would be the GWG-100 series. With GWG-100, yes, it will still automatically adjust the time if the battery is at Medium, but that feature will be disabled if the battery is at Low. You can also choose to disable that feature. It’s not normal but not unheard of. There is probably some moisture trapped in the watch.